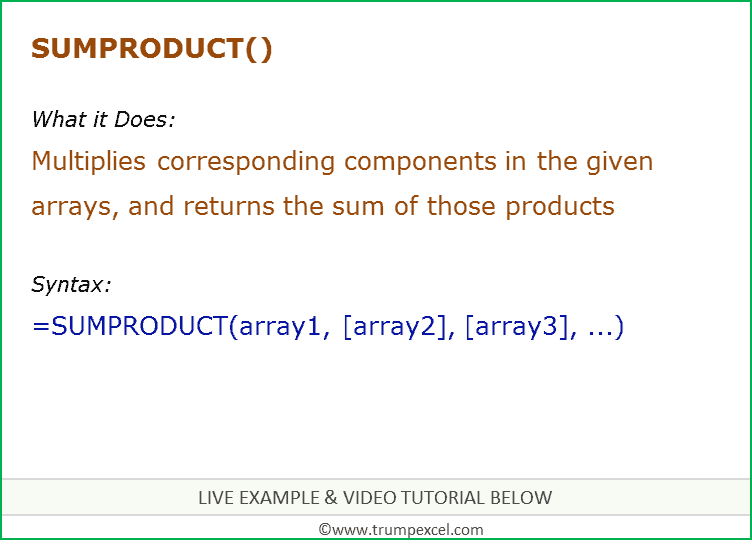 SUMPRODUCT function can be used when you want to first multiply two or more sets to arrays and then get its sum. It returns a number that represents the sum of the product of two or more arrays. array1 – The first array argument whose components you want to multiply and then add. [array 2] – (optional) Second array arguments whose components you want to multiply and then add. There can be a maximum of up to 255 arrays that can be used in SUMPRODUCT function. The size of all the arrays must be the same. Non-numeric entries are treated as 0.